We’d love your help. Let us know what’s wrong with this preview of Democratic Autonomy in North Kurdistan by Tatort Kurdistan. 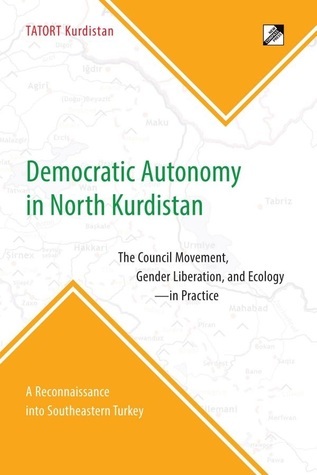 Since 2005, under the most difficult of conditions, the movement in North Kurdistan h In the fall of 2011, a group of TATORT activists journeyed into the Kurdish regions of Turkey to learn how the theory of Democratic Autonomy was being put into practice. They discovered a remarkable experiment in face-to-face democracy—all the more notable for being carried out in wartime. Since 2005, under the most difficult of conditions, the movement in North Kurdistan has created structures for a democratic, ecological and gender-liberated society. At its core is a system of councils in villages, cities, and neighborhoods. These structures do not yet offer a way of life that is fully independent of the nation-state and the market economy, but they nonetheless reveal a potent civil counter-power. To ask other readers questions about Democratic Autonomy in North Kurdistan, please sign up. Is this available as a e-book? This book consists of interviews from activists of Democratic Autonomy. It's very interesting to see the theory practised into reality and the dedication and devotion of the people. This is a great book for people trying to get a grasp of alternative lifestyles and I highly recommend it to all leftists around the World. This book also reveals the true nature of the Turkish state against the Kurdish people and the enlightenment they are going through today.